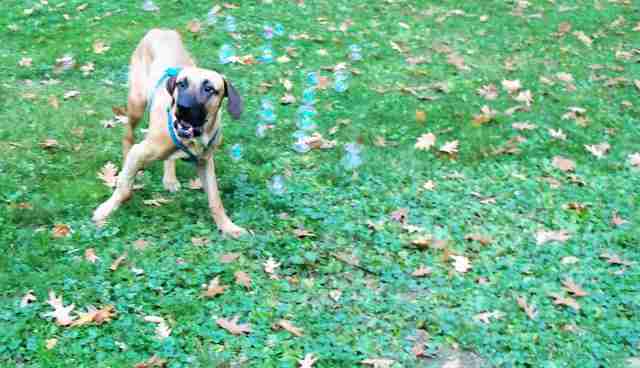 Now he's a happy dog who loves to play with bubbles. 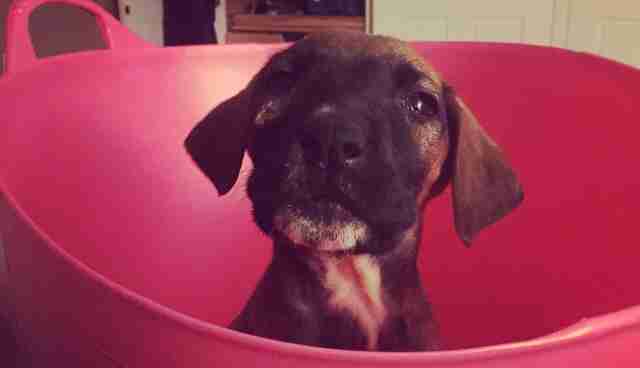 After everything the puppy had been through, it was incredible he was still alive. 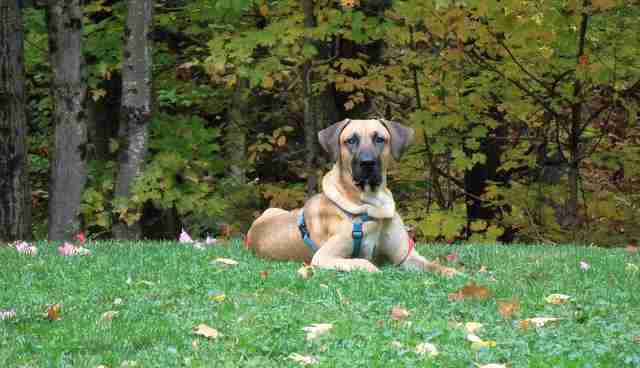 Charley, a mastiff mix, was born at a meat farm near Wonju, a city in South Korea about 87 miles east of Seoul. Charley, his mom and his four siblings lived inside a metal cage housed in a shed made of tin and plastic. The farmer who bred them fed the dogs a kind of "gruel" made out of old vegetables, rotting meat and water. They had no bedding and no fresh water. Their cages were never cleaned, and excrement piled up in the corners. The shed had no ventilation and the stench was overwhelming. 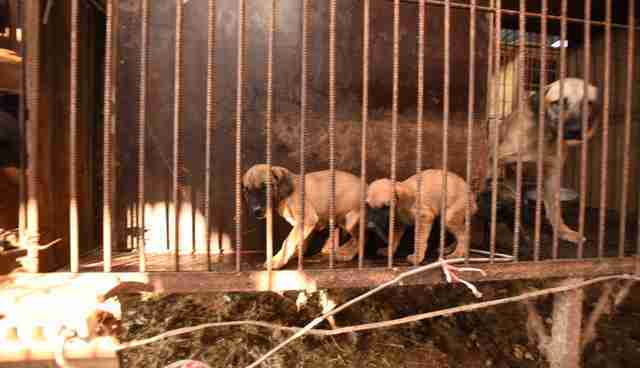 Besides Charley and his family, there were over 200 dogs at this particular dog meat farm. When the dogs were big enough, they'd be slaughtered, and their meat would be sold to nearby restaurants. 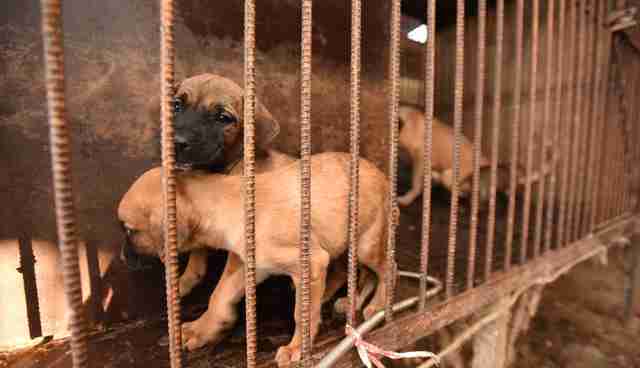 Dog meat farming is actually legal in South Korea - and it's a massive industry. 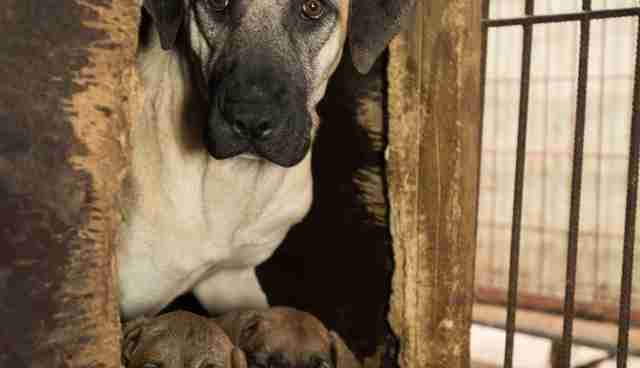 Kelly O'Meara, director of companion animals and engagement for Humane Society International (HSI), told The Dodo that an estimated 2.5 million dogs are raised for meat in South Korea every year. 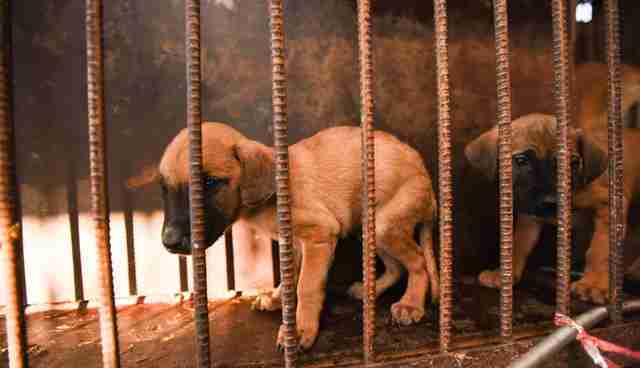 HSI has been working to shut down the dog meat trade in South Korea by giving farmers incentives to stop killing dogs. They'll offer financial assistance to farmers to start another career, as long as the farmer agrees to leave the dog meat business, relinquish all his dogs to the HSI and destroy the metal cages. In May 2016, John Peaveler, an animal welfare consultant who works as a contractor for HSI, helped shut down the South Korean meat farm where Charley was being held. Peaveler then transported the dogs to the U.S. and Canada. The process, according to Peaveler, wasn't easy. "We rescued them in batches," Peaveler told The Dodo. "You can only fit about 18 dogs on a plane, and that's if most of them are small, but many dogs are quite large. So one truck a day with 14 to 18 dogs on it to the airport, and back to the hotel to do the next batch. It's a very painstaking process." 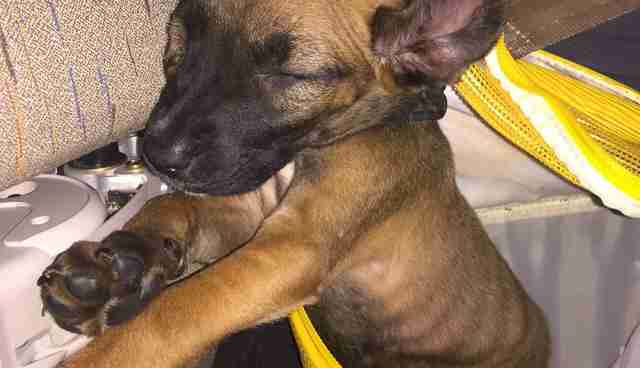 While most of the dogs were ready for immediate transport, Charley got held back. "Charley was quite sick," Peaveler said. "We thought he wasn't going to make it." 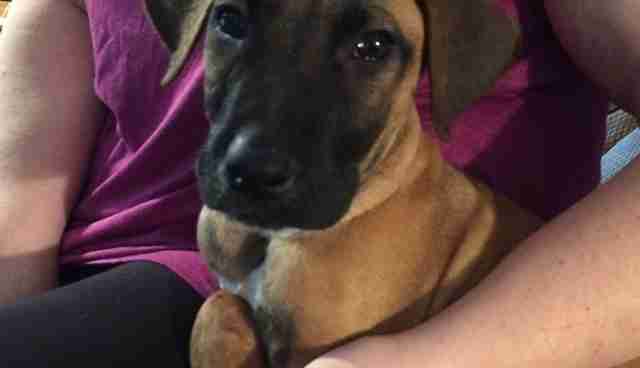 Charley was sent to a local vet hospital, where he was treated for worms and parasites. When he was strong enough to fly, Charley got a seat of honor in the cabin as he flew with Peaveler to San Francisco. 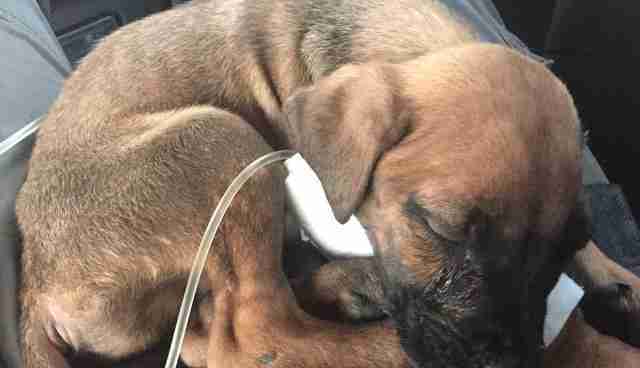 While animals are technically supposed to stay in their crates and underneath the seat in front of them, the flight crew bent the rules for Charley, especially after they heard what he'd been through. "The flight crew were taking shifts," Peaveler said. "They were switching positions so they could have puppy time." Peaveler initially fostered Charley at his home in Vermont, but he already had three dogs, and he knew Charley needed more individualized attention. Peaveler brought Charley to a local Humane Society United States (HSUS) meeting, and it was there that Charley met Jennifer Riccio. "Someone had just come in from walking Charley," Riccio told The Dodo. "He came up to me and started nudging my hand." Riccio fell madly in love with Charley and offered to foster him. But after spending two weeks with him, Riccio knew she wanted to keep him. Charley had his forever home now, but his troubles weren't behind him. A few months after arriving at Riccio's, Charley started having problems with his legs. "His front leg was twisting," Riccio said. "He has a lot of trouble walking on it because it was so twisted." 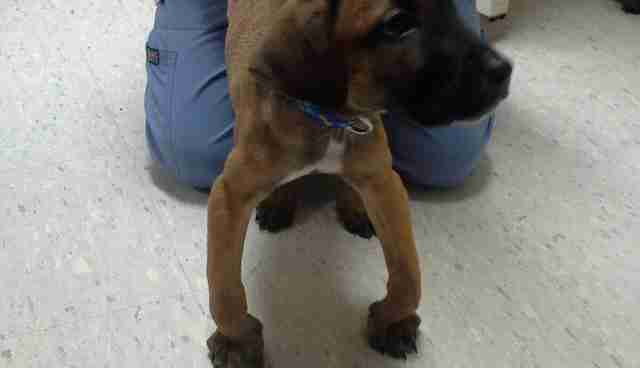 The vet told Riccio that Charley's leg issues were due to the malnutrition he suffered at the dog meat farm. Now that Charley was getting enough nutrition in his food, some of his bones were growing normally. Other bones, however, had stopped growing. 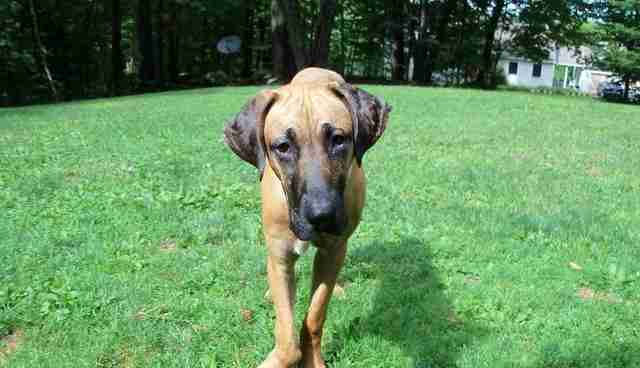 He said Charley needed surgery, and might need surgery on his back legs too at a later point. "He was having such a hard time walking, so he was constantly falling," Riccio said. "Two weeks before his front leg surgery, we had to carry him everywhere - in and out of the house. It was really sad to see him like that." Charley's procedure was successful, but he got a massive infection and was quarantined inside the house until he got better. "A lot of times we couldn't have him running or anything, so when he was in the house, I'd blow some bubbles for him," Riccio said. "He'd absolutely go crazy - he'd try and bite them." 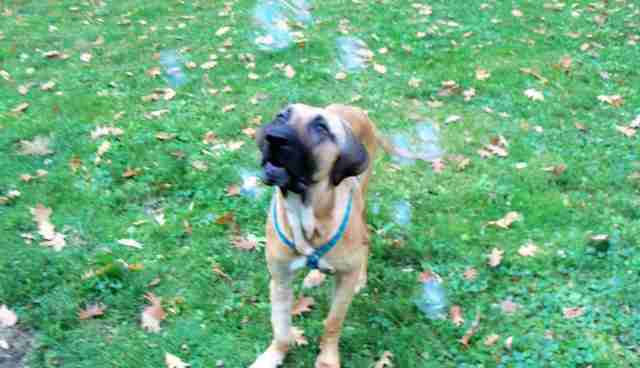 Charley's passion for bubbles didn't stop when he got better - in fact, he became more obsessed them. "We'd go outside, and I'd blow bubbles for him, and he just loves it," Riccio said. "He knows where we keep the bubbles in the house, so he'll go and sit down next to the cabinet, and start looking at it as if to say, 'Get the bubbles out!'" Charley is doing much better now, and Riccio believes he'll make a full recovery. "He's just such an amazing dog," Riccio said. "With everything he's gone through, he's so sweet and he had such a will to survive. It was actually quite inspiring because there were many times when it looked very bleak for him. He's just this really sweet, gentle boy, and we feel really lucky to have him." To help HSI in its fight against dog meat farms - and to help other dogs like Charley - you can sign this pledge or make a donation here.